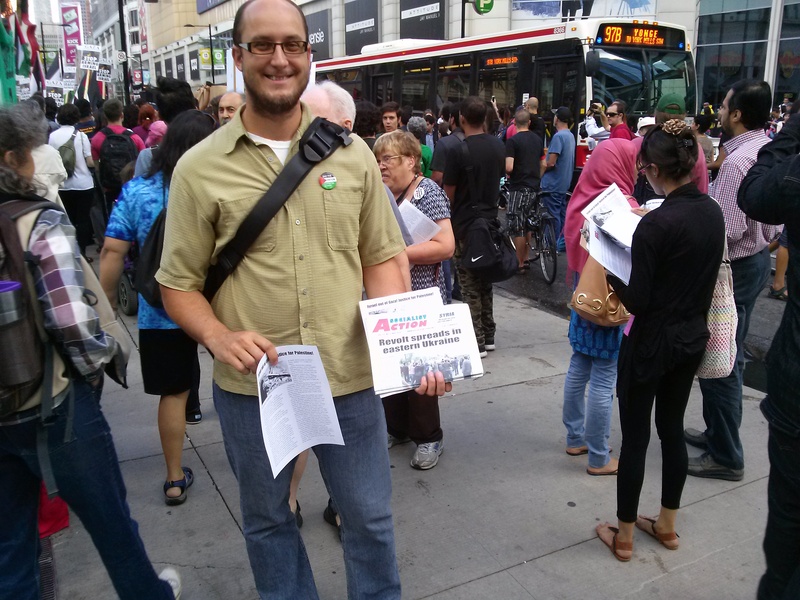 Thousands demanded ‘Israel Out of Gaza’, ‘Boycott, Divestment and Sanctions’ against the Zionist state, and cried ‘Free, Free Palestine’ on the streets of downtown Toronto on July 30. A boisterous rally at Dundas Square heard Ontario Federation of Labour President Sid Ryan and other speakers denounce the Conservative federal government for complicity with the Israeli military onslaught in Gaza that has seen over 1,300 Palestinians killed, chiefly by the bombardment of residential areas, including schools and health clinics. Spokespersons for the Coalition Against Israeli Apartheid, and some of the 40 other sponsors of the event, also sharply criticized Thomas Mulcair, New Democratic Party head and Leader of the Official Opposition in Ottawa, for his strident and uncritical support of the Zionist state. 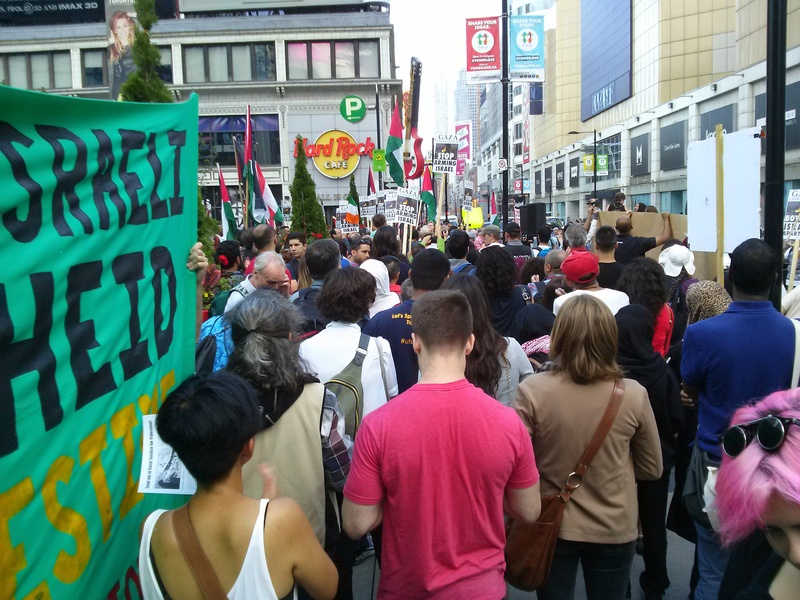 The rally fed a massive march of about 4,000 to the Israeli Consulate, across from the Royal Ontario Museum at Bloor and Avenue Road. En route, protesters staged a ‘die-in’ at the Bed Bath and Beyond store at Yonge and Gerrard, chanting: ‘1, 2, 3, 4, SodaStream Out the Door!’ SodaStream supplies products to make carbonated drinks. Its main production facility is on an illegal Israeli settlement, Ma’ale Adumim, in the occupied Palestinian West Bank. CAIA urges a boycott of Israeli products and services, and those of international companies involved in Israel’s human rights violations. The most common Israeli exports include fresh fruit and vegetables (such as Jaffa citrus fruits and Israeli Medjoul Dates), Ahava cosmetics, SodaStream drinks machines, Golan Heights Wineries and other Israeli wines. On July 26 an even larger gathering was held in connection with the annual Al Quds (Jerusalem Day) Muslim celebration. Official spokespersons claimed, at the concluding rally held across from the U.S. Consulate on University Ave., that it was the largest pro-Palestine, anti-Zionist gathering in North America that day, with over 25,000 participating. 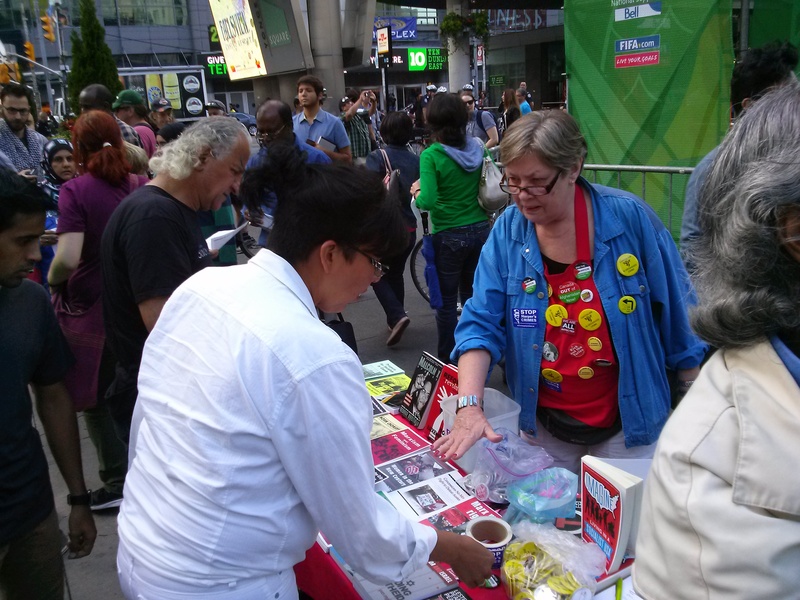 Socialist Action participated with a banner, a contingent, and by setting up its display table at both ends of the protest. SA members sold $302 in literature, press and buttons. Twenty-five people signed up for more information. Despite the huge crowd, many of whom came by bus from Mississauga, north-west of the city, there was a scarcity of union banners/flags. However, people carried a wide variety of placards, both professionally produced and home-made. The most common ones stated ‘Freedom for Palestine’, ‘Boycott Apartheid Israel’ and ‘No War on Gaza’. 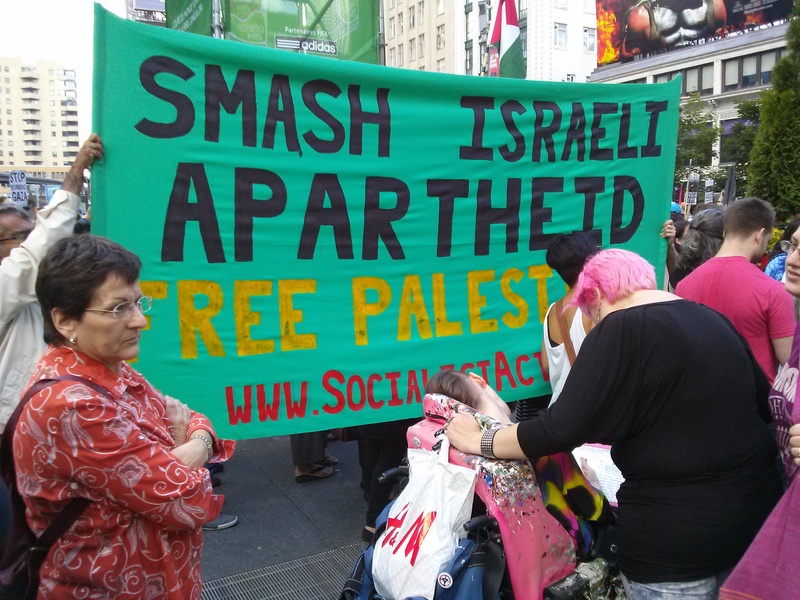 A huge hand-made sign read ‘Guatemala Supports Palestine’, and others stated ‘Stop Killing Children’ and ‘Zionism=Racism’. Organizers at the concluding rally released over a hundred balloons, each representing a child killed by the Israeli military. Rival gatherings contended for attention at Queen’s Park on July 26. A Toronto Star article reported that “critics of Israel’s military assaults, and defenders” of the Zionist state, stood opposed to each other, which was true. But the article failed to mention that there were well over 20,000 in the pro-Palestinian rally, and its march down University Avenue, while less than 800 participated in the Zionist assembly. A posted video recording, taken from high above the crowds by a drone helicopter-mounted camera, as well as thousands of ground-level photographs, prove the point. The ratio was 20:1 in favor of the supporters of the beleaguered residents of Gaza. Was omission of the facts concerning the huge disproportion between the two sides that gathered in front of the Ontario Legislature, merely an oversight? Or was it a reflection of editorial policy?